I think in the past 6 months Em's hair has tripled in length. We have been using the fabric bows I made last year on a daily basis to keep it pulled back out of her eyes. I made these sweet little heart shaped clips to add to her clip collection. 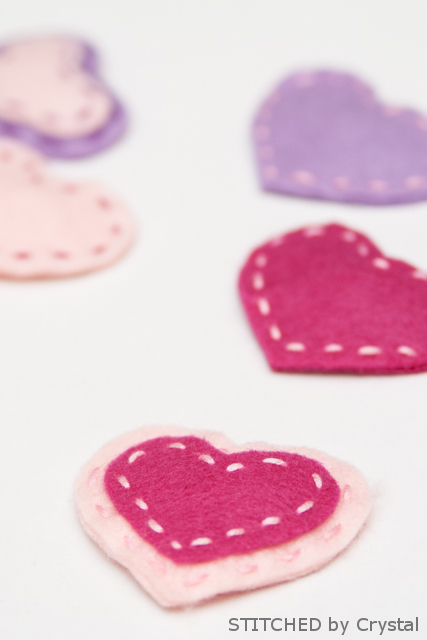 They are perfect for Valentine's day but are something she can wear year round too. 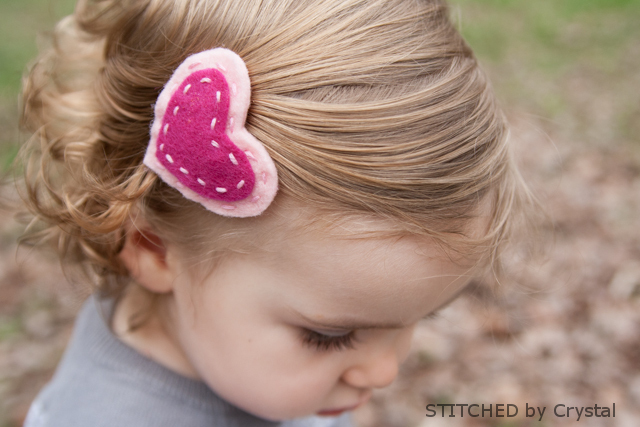 These clips are made of felt and are super easy to sew. 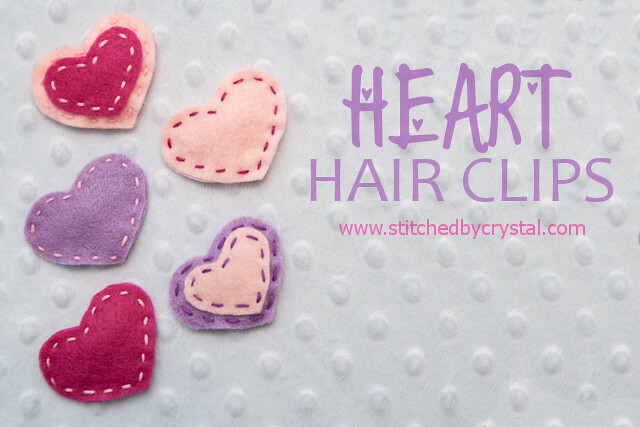 They are a quick, easy, and inexpensive way to add a little Valentine's day love to your little ones hair. 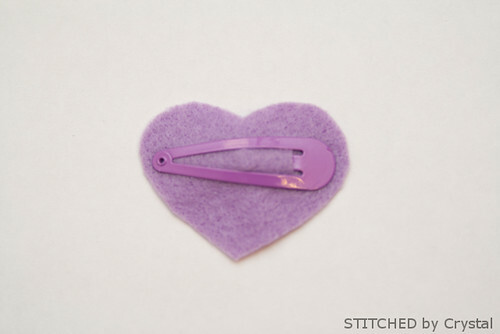 They are made with those little snap clips and the clip is sewn inside. They are easy to get on a wiggly toddler and stay put pretty well too. 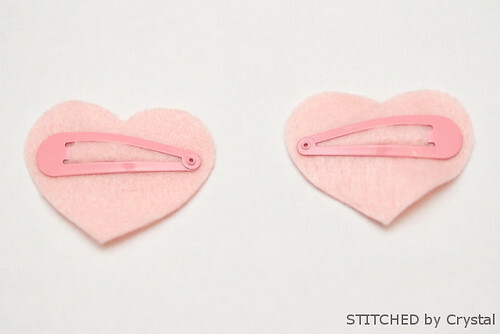 To make these clips, all you need is some scrap felt and embroidery thread. Start by cutting a template for your clips. I used a heart shaped cookie cutter, traced it on a piece of paper and cut it out. You will use the template to cut all you hearts for the clips. The heart needs to be slightly bigger than your clip. 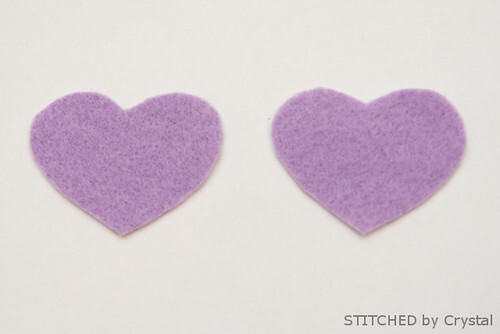 Use the template to cut out 2 hearts for you clip. 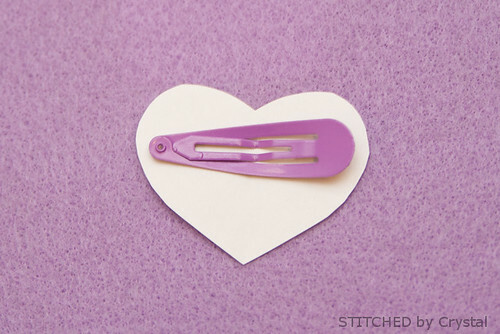 Cut a small slit on one side of one of your hearts and stick the small part of the snap clip through it. I always part Em's hair on the left and use the clips on the right so I put my clips in as shown in the picture above so the heart will be right side up when I use the clip. Put the clip the other way to use it on the left, or make a matching set for both sides. 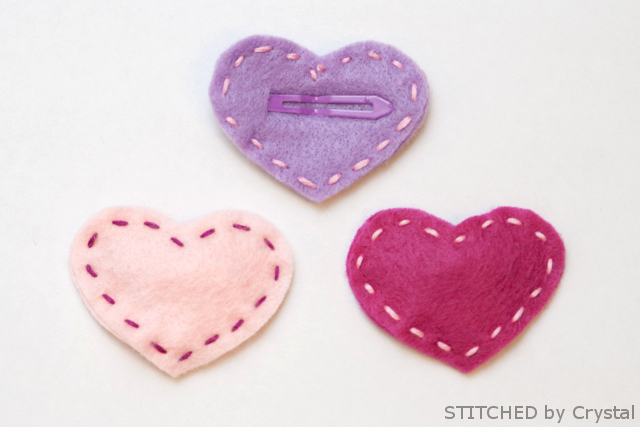 Place the other felt heart on top, sandwiching the clip inside. 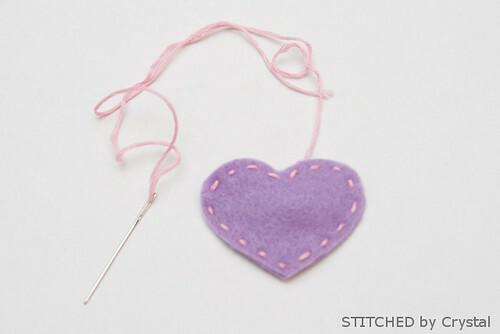 Sew around the edge with the embroidery thread. 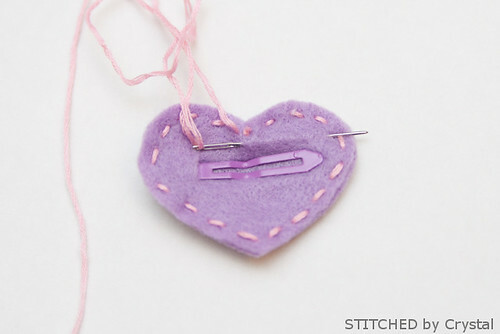 Bury the string in between the two hearts and trim off the extra. They are fun to get creative with too. 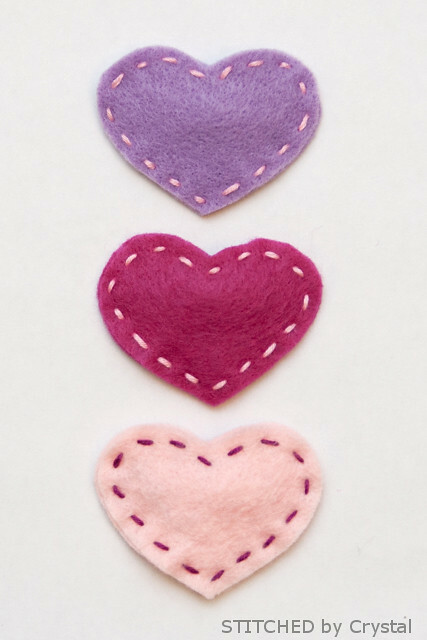 I made the little double hearts by sewing the smaller heart in the middle of the big heart before making my clip. Those are very cute clips! I don't have a little girl at home, but I think I will have to make some of these for my niece for her Birthday sometime! I love the stitching on them, so cute! I LOVE THESE! One of these days my daughter will get enough hair for things like this and I will have to make her lots of hair clips like these. It looks so easy! Lisa @ Sew Much Fun! Great stuff! My daughter is would enjoy to craft something embroidery threads.